Since there are five Wednesdays this month, I have my goals post today. Otherwise, it'll be with Bookworm News posts. Create a map of the Kingdom of Amora. I know how long it takes the characters to get from place to place. Now it's time to figure distances and draw the map for the trilogy. Finish outlining Redestined. I've finished through Chapter 27 in my outline for book three of The Fate Challenges, but I still have a few chapters left in Part II and all of Part III to outline. My guess is Redestined will have around forty-five or so chapters and will be the longest book of the trilogy. Continue working on Reforged. With NaNoWriMo 2013, I wrote up to Chapter 16 in Reforged. In January, I've been editing/rewriting the beginning. I'm hoping to be able to write new chapters by the end of February. Edit an old short story. Untethered Realms is putting together an anthology. I originally thought about writing a new story, but I found an old story of mine that'll work, I think. It's time to do an edit on it, so I can get it ready for the anthology. I'll be taking a break from Reborn as soon as I finish this final edit, so my proofreader can have a go at it. If I get it back sooner than March 1st, then I'll start working on it again in February, but it can wait until March. I'd like a fairly clean copy to go to my reviewers in mid-March. Personally, I've found most people want the complete collection instead of individual ones, especially when it comes to shorter works. For example, I sell almost two times more Gravity: The Complete Trilogy than I do the individual ebooks put together. Last year, I had four months I didn't sell a single copy of Defying Gravity, nine for Fighting Gravity, and ten for Pull of Gravity, yet I sell copies every month of the complete collection. It's different for my horror works, since I had Once Upon a December Nightmare free for so long, but I'm curious to see if that changes, since it's $0.99 again (sequel is $2.99 and entire collection is $2.99). I know they say having more works out there leads to more discovery of your work, but to be honest, I sold more when I had one ebook out than I do now. I'd like to eventually take down the individual ebooks and keep the collections only of my shorter works. I'll likely do that sometime this year with Gravity and do the same with my Foxwick Chronicles short stories. So if I'm going to take down the shorter collections this year, then why put a new one out when I'll likely take it down in six months? I can wait and release the entire People of Foxwick and Their Neighbors (an 80,000-word short story collection) and put it for a cheaper introductory price for a couple weeks and then raise it to its normal price. That way people who have purchased the shorter collections can get the entire collection for the same price I would've sold Neighbors of Foxwick. That said, I plan to start working on People of Foxwick in May/June, since Reborn will be out of the way. I will likely write Loveless (Book One of Less Than Princess Perfect series) during this time, since it's part of the Foxwick world. Then, it'll be time to go back to Amora in August/September for Reigned (Prequel) and then Redestined (Book Three) after that. Also, A-Z Blogging Challenge sign-ups are going on! Unfortunately, this year I won't be able to participate on this blog. With publishing my debut novel in May, I just have a bit too much to do in April, but I will be participating with the authors of Untethered Realms. We're going to be talking about creatures--and not the normal kind. Also, I'm over at Nutshell's blog today where she featured me and my writing space, so pull up a chair and see where the magic happens. Wow, that is just another epic cover! So you'll be combining some of your works? That's cool. 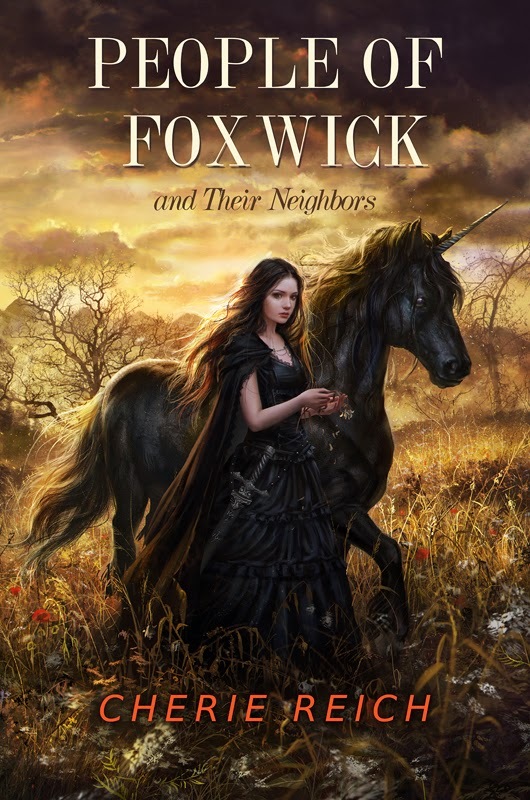 The cover of People of Foxwick is great. Kingdom of Amora has a epic feel to it. Good luck with your goals. I agree with Alex, what a great cover! Lovely to have you over at my blog today! Love the new cover. Interesting how the full collection does so much better sales-wise than the smaller books. Aggressive goals and another stunning cover! Wow, are you busy. That cover is amazing. Laura is truly talented. Interesting on your sales. I've considered bundling the first three Backworlds books but I think I decided against that. I haven't finished by new story and am debating contributing an already written story too. It sounds like you have given a lot of thought to what you are going to release and when. Your plan seems to make a lot of sense and sounds good to me! Wishing you lots of luck with your writing and your outpatient surgery. Count me with everyone else who thinks the cover is AWESOME!! Your book covers are always so lovely! Wow, that cover for People of Foxwick is absolutely gorgeous! Also, good luck with all your goals! I'm so impressed that you're going to be creating your own map. Even though I'm an artist, I don't think I could ever make one of those! I'm sure you'll do good on your goals and that cover is amazing. Best of luck with getting everything done! You're on a roll, Cherie! A new kingdom and all kinds of great goals. Congratulations. VERY cool cover, Cherie. Keep on keepin' on. All your covers are super, Cherie. Here's to another one! I'm one of those people that likes the complete collection. Beautiful covers! And great goals! You are so good at setting goals. There is so much involved with writing and publishing. But, I personally am glad you put so much time into your books, because this trilogy sounds great and I cannot wait to read it.